They say that imitation is the sincerest from of flattery. In that case, I'd like to think the publishers of Guillotine, a quick and humorous little card game that has been out for over a decade, should be very flattered. I've only played Guillotine once a couple months ago but I only needed to read the rules for YOU Are The Maniac to realize that it's pretty near the same game. Oh, the theme is different and Maniac adds a few new twists (plot twists, final girls, etc.) but the inherent gameplay is pretty much the same. 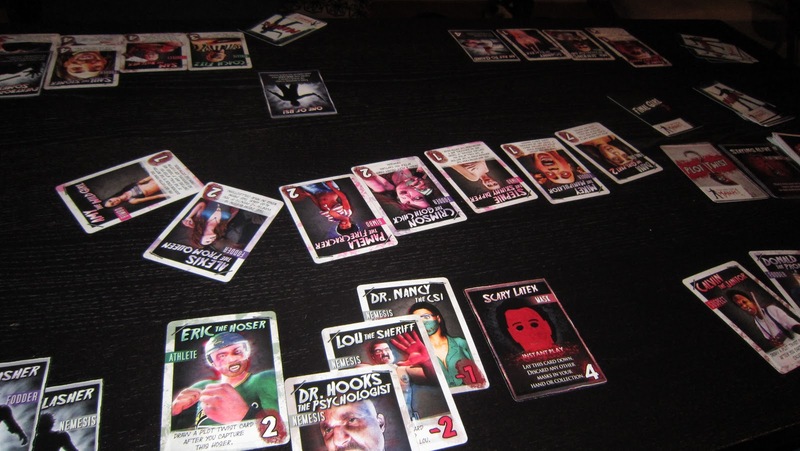 Basically a line-up of victim cards is made (horror movie victims in Maniac, French aristocrats in Guillotine) and each turn a player may play an action card then takes (kills) the first victim card in the line-up. The actions do things like re-arrange the order of the victims, force opponents to discard cards, switch hands, etc. Now certain cards give more points for certain victims, some cards combine to provide bonuses, etc but in general that's the game. And in both cases it's featherweight-light and very short. If either of these games lasted more than 20 minutes, I would cry tears of sheer boredom. Where Maniac diverges is by adding more chaos to the formula. At certain points, plot cards will need to be drawn, and the final victim on the wall is always worth a hefty ton of points. And if you're into the theme of horror movies, it actually is quite amusing. In our game the Final Girl was killed in Part 1 but then escaped and showed up in Part 2 (the second round) and I immediately pictured Jamie Lee Curtis making to Halloween 2. But these chaotic elements definitely remove what miniscule control one has over anything in the game. Again, short game, thank god. I guess your enjoyment of the game will hinge on a few things - theme, originality, and lightness of play. 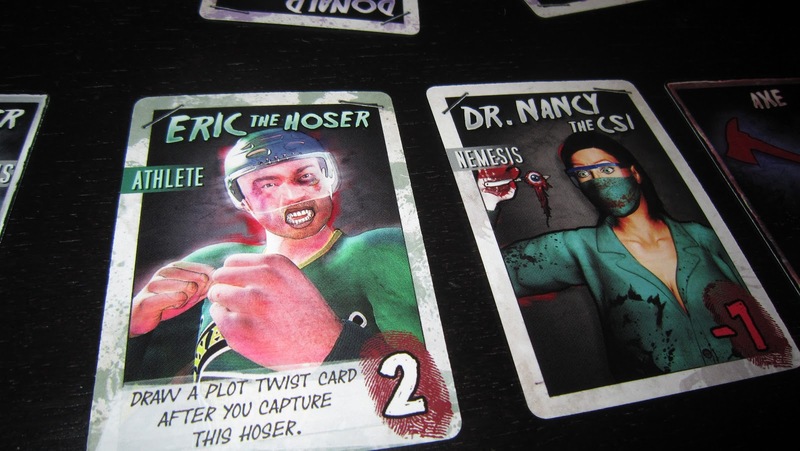 The horror theme actually is a bit amusing and the characters add some amusement. But if you own Guillotine, I dare say you don't need theis game. It's pretty much the exact same game re-skinned but confused by some extra rules. They are so similar that even The Count and Countess cards in Guillotine are renamed as Prom Queen and Prom King and score exactly the same in Maniac. Yikes. As well, as I said, it's very chaotic and random so this will aggravate anyone who doesn't like that sort of thing. Wow. Totally Guillotine. Good call. I use that game as a gateway game for friends. Sidenote: on the horror front - picked up a copy of City of Horror on the weekend. You interested in playing?! خلال الفترة الأخيرة تنوعت مؤسسات التنظيف على صعيد السعودية ولكن من أشهر المؤسسات في المساحة القصيم مؤسسة تطهير مجالس بالقصيم فهي من اكبر المؤسسات المختصة في عملية تطهير المفروشات سواء باستعمال البخار او مواد التنظيف التي لا تتضمن على مياه وعند الغربة في نظافة مثالية غير ممكن ان تجدها في اي موضع أخر فيجب ان تستمر على مؤسسة تطهير مجالس بالقصيم فسوف تجد لدينا أيدي عاملة وطاقم تطهير يقوم بتطبيق عمليات التنظيف في الموضع وكذلك داخل مقرات مؤسسة لؤلؤة العربية وفق مناشدة الزبون ولدينا أسعار مسابقة بشكل كبير وجودة دولية اتصل وسوف تجدنا .